The Cartoon that started it all. Mammy Two Shoes warns Tom, known as Jasper in this toon, that if he breaks one more thing he's out the door. Jerry, known as Jinx in this toon, decides to help his enemy out the door and succeeds. Tom and Jerry battle over refrigerator rights. After various fighting and a clever maneuver by Jerry, Tom gets the boot out the house by Mammy. Christmas Eve finds Jerry running around the Christmas tree happy as can be. Then he finds himself bumping into Tom, more running ensues. Eventually, Jerry ends up out the mail slot and freezing in the cold. Tom, has a change of heart, it's Christmas after all, and lets Jerry back in. Tom is listening to a scary radio station. Jerry takes advatage of the frighten kitty by making a ghost out of a vacuum cleaner and a nightshirt. Eventually, the tables are turned and Jerry frightens himself. Tom is chasing Jerry around the house. Jerry runs into a sleeping Spike (his debut), who promptly chases both cat and mouse. In a joint effort with Tom, Jerry winds a web of yarn around the living room. Spike gives chase and pulls all the furnishing with him. Mammy finds the dog in the trap and gives him the boot! Mammy babysits a pretty kitten. Tom turns suave! He offers her a goldfish, a canary and a mouse. He tries to impress her with parlor tricks with Jerry as the magic coin. Jerry, angry at being used like this, turns the tables and wreeks havoc on Tom with a record player. Adventures in the fast lanes, as Tom chases Jerry through a bowling alley. Fun and exciting as bowling aught to be. Tom tries to trap Jerry in the barnyard. But Jerry enlists the help of a mother hem who is very protective of her nest. Jerry is besieged by both Tom and an orange cat (Meathead, in his first screen role). Jerry plays off both cats into fighting each other and makes his escape. When Tom gets kicked out of the house yet again, Jerry things it's his lucky day. He has fun in Tom's suacer of milk, defaces his picure and tears up his basket. But the thrill of the chase is gone and Jerry misses his nemesis. Jerry uses the unwitting Mammy's assistance to get Tom back into the house. Utterly charming tribute to America's fighting men. 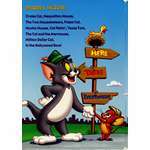 Jerry has a cat raid shelter in the basement of a house where he battles Tom. Oscar winner and patriotic. Tom is forced to play baby for a little girl. 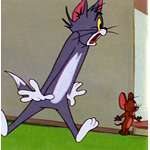 Jerry laughs at him and Tom gives chase and kicks him out the room. Jerry brings in three alley cats who in turn have a little fun with "baby" Tom. They before a Carmen Miranda-sh rendition of "mam, You Quiero." The little girl returns, the ally cats run away and Tom is punished with a dose of castor oil. Jerry doesn't escape the castor oil punishment either. Tom tries to woo his girlfriend with a zoot suit made from a hammock. However, Jerry ends up with the suit and the girl in the end. Tom inherits a million dollars from a relative, but the stipulation in the will is that he "refrain from harming any living creature, including even a mouse." Jerry takes full advantage of this, who constantly reminds Tom of the condition in the will. Eventually, Jerry pushes Tom too far. Tom tears up the will and then tears into Jerry, throwing away a million bucks. Jerry frees Spike from the city pound truck. Spike promises that if Jerry ever needs anything to "just whistle". Jerry whistles, Tom gets crushed, we laugh. Tom chases Jerry into the dog pound. Finding himself on dangerous ground, Tom disguises himself as a dog to find Jerry. Once it is discovered that Tom is a cat, the dogs chase him up a flag pole. Tom is reading the book, "How to Catch a Mouse". Tom uses every trick in that book, but Jerry is too smart for that. Jerry is pressed into "service", when Tom invites his kitten girlfriend over for dinner. Tom gets too amorous with his girlfriend, who hits him with a hammer labeled "wolf pacifier". Jerry gets into the act of beating on Tom and a free for all begins. Tom ends up in the punch bowl. Country mouse Jerry takes a trip to New York. He admires skyscrapers, stumbles into a powder room, dangles over the city on a candle, and dances the night away. He is confronted by hungy alley cats, shot at by police, and chased by a subway train, he returns to the safety of his country home. On the golf course, Tom uses Jerry for a tee, and the fun begins. They make a boring sport, fun! Just as Tom is about to eat a Jerry sandwhich, a hawk swoops down and takes it away to have for himself. Tom disguises himself as a lady hawk to get his sandwhich back, but the hawk falls for him. Tom can't get rid of the lovestruck bird. Tom pursues Jerry into a sleeping Spike. Spike warns Tom that if he makes one little noise, he'll skin Tom alive. Jerry takes the cue and makes every effort to wake the dog. 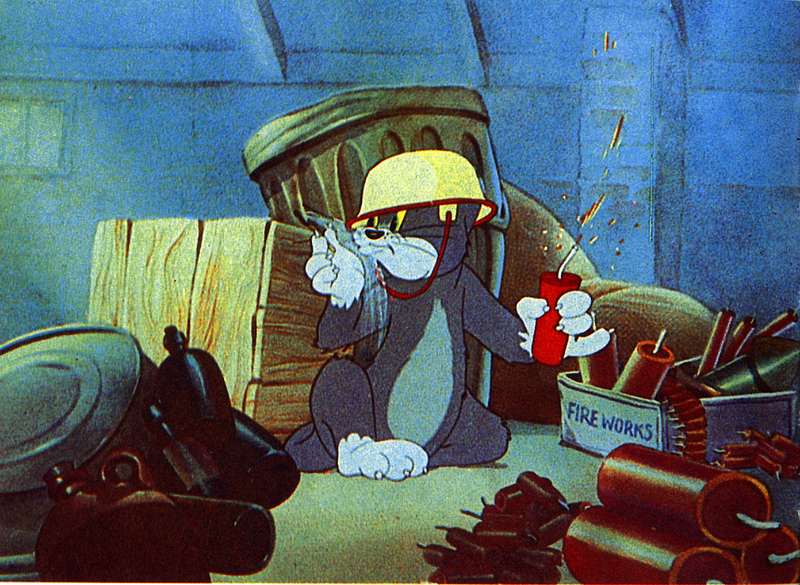 Jerry succeeds with a firecracker, Tom ends up bandaged head to toe rocking a sleeping Spike. On a beautiful spring day, Tom stares dreaminly at a girl cat sunbathing. He gets the courage to go talk to her and Jerry tries to break up the budding affair by getting Meathead involved with a forged letter. The race is on for the affections of the girl. 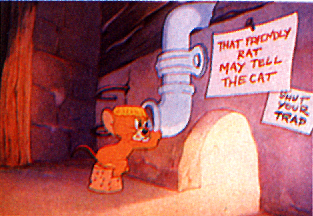 When baby mouse Nibbles (screen debut) is abandoned on Jerry's doorstep, it spells trouble for both Tom and Jerry. Nibbles show's his mettle when he protects Jerry with a frying pan to Tom's face. Jerry shows his heart when rushes to the rescue after Tom hits Nibbles with a flyswatter. Tom calls in an exterminator (Meathead) to dispose of Jerry. But all attempts fail as Jerry cleverly out wits his foes at every turn. Tom brings along his bass fiddle to seranade his girlfriend, but Spike is in the yard. Tying up Spike he proceeds to woo his girlfriend with "Is you Is". He is hampered in his wooing by a music loving mouse name Jerry. 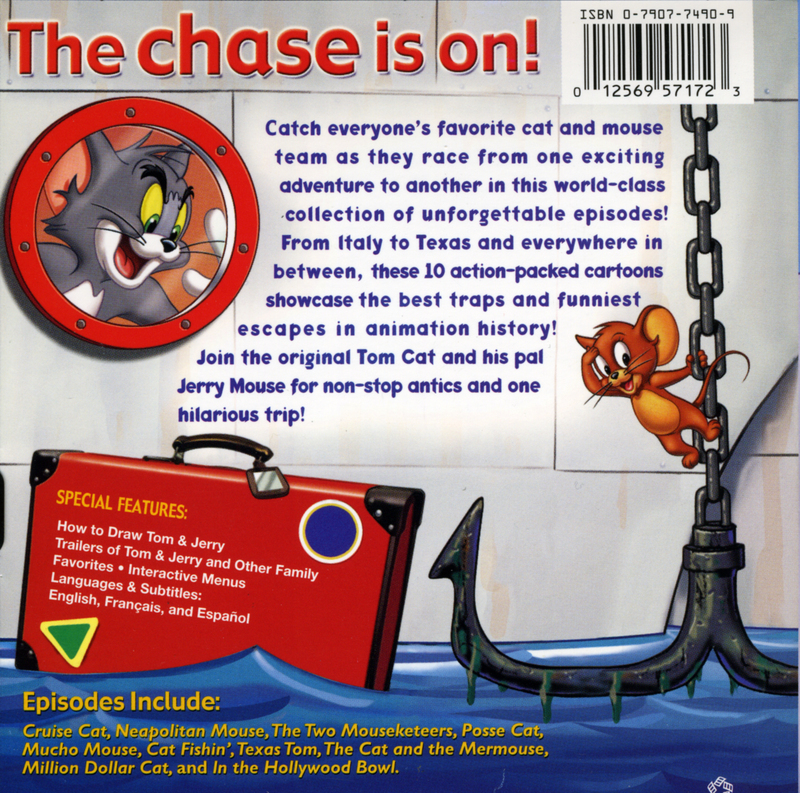 On a fishing trip, Tom uses Jerry for bait. Jerry is not to happy about this and uses Spike to get back at Tom. The dangers of alcohol. Tom falls into a barrel of cider, gets drunk, raids the fridge, pals up with Jerry, tries to give Mammy a hot foot, and then douses her with a pitcher of water. Mammy is not happy about that and chases the cat out the house and down the street. Tom is the snooty piano player. Jerry is the music loving mouse that sleeps in the piano. Tom plays Hungarian Rhapsody No. 2 while Jerry listens. Tom starts pushing Jerry around and then Jerry ends up finishing the concert and receiving the applause. Jerry turns into a supersized supermouse thanks to a concoction of Tom. Jerry finally gets a chance to turn the tables on Tom by pushing him around. Tom trys to woo a girl at the beach. Jerry interupts the wooing. Tom is not too happy and he begins to chase Jerry all over the beach. In the end, Jerry sails away with the picnic basket. Mammy warns lazy cats Tom and Meathead that whomever fails in catching Jerry is let go. After wrecking most of the house and attacking Mammy, the cats are both kick out as well as Jerry. Jerry is being chased by Tom and ends up in a bottle of invisible ink. He discovers that he can't be seen and proceeds to use it towards his advantage. In the end he whacks Spike with a golf club and leaves Tom to take the blame. Jerry teams up wiht a canary to fight off Tom. Trains and bowling balls join in the fray. Spike decides to make amends with Tom and Jerry, but the peace falls apart when they fight over a juicy steak. Mammy replaces Tom with a ginger cat named Lightning. Lightning gets Tom in trouble getting the Tom kicked out of the house. Tom and Jerry decide that Lightning has to go and team up to get rid of him. Tom is teaching his student kitten how to catch a mouse. Jerry befriends the kitten much to the dismay of his teacher. When Tom tracks mud into the house after Mammy just cleaned, seh tells him he must restore its shine before she returns from market. Jerry takes the cue and tries to mess up the house, succeeding with a shipment of coal in the living room. Mammy is not happy. Jerry paints Tom's face while he is sleeping. Jerry convinces the cat that he has measles. He puts himself in Jerry's hands for some rather creative nursing. In the end the hoax is discovered, but Jerry does get the measles and then gives it to Tom. Jerry kindly invites orphan Nibbles to Thanksgiving Dinner. The two join forces to thwart Tom and have a peaceful dinner all together. When an egg ends up in Jerry's bed and hatches there, a baby woodpecker thinks that Jerry is his mom. Tom tries to gain entrance to the pearly gates but is turned away unless he can obtain a certificate of forgiveness from Jerry with an hour. Tom find it is more difficult than would seem. Underwater adventures as Tom chases Jerry beneath the sea. Tom and Jerry's perpetual chase leads them smack into the path of little Pup (Tyke) and his dad Spike. Spike (known as Butch here) warns Tom to stay away from Tyke. Jerry stays close to Tyke and Tom can't help but get near to get at his foe. This is the first Tom and Jerry toon with flashback's. It is highlighted as Tom read's Jerry's diary. Tom and cat foe Meathead (Butch) play an aggressive match of tennis with Jerry as the ball mouse. The screen debut of Quacker. The duck is nabbed by Tom and Quacker finds protection in Jerry. The eventually find Quacker's parents who in turn punish Tom for messing with their little duckling. When Mammy goes out for the eveing, Tom and his cat pals, Shorty and Meathead, through a party. "Darktown Strutter's Ball" is the tune that gets the cats partying. A sleeping Jerry doesn't like being awoken by the raucous and phones Mammy. She returns and kicks the cats out, only to turn up the same tune; much to the dismay of Jerry. Jerry hides an escaped lion in the house, while Tom is on the hunt for the lion to get the huge reward. Jerry then sees the lion off on the S.S. Africa, tearfully waving goodbye. Jerry and Nibbles celebrate the Fourth of July. Nibbles wants to blow things up and Jerry wants to play it safe. Tom gets involved and ends up getting blown up. Tom is conducting an all cat orchestra to the overture to "Die Fledermaus". Jerry wants to conduct as well, but Tom will have none of that. Jerry retaliates and Tom ends up playing the rest of the overture solo with Jerry conduting. Spike warns Tom to stay away from his bone. Jerry keeps planting it on the unsuspecting Tom getting him in Lots of trouble. A riotous game of pool results when Tom wakes Jerry from a nap in the pool table. Never wake up a sleeping mouse. Again a women gets the attention of Tom. Tom enlists an unwilling Jerry's help who promptly tries to interupts the wooing with a bull. Tom offers Jerry as a gift to Toddles, a weathly feline that Tom is trying to impress. But Jerry calls up Meathead from the alley and a fight for the ladies affection begins. In the end Jerry ends up with the woman. Tom tries to cook Goldy, the goldfish. Jerry is on hand to rescue his fishy friend from chef Tom. Muscles, Jerry's cat-curdling cousing, arrives to help get Tom under control. Muscles is a mean streets mouse, and more than a match for Tom. When his muscle building regime doesn't work, Tom calls in his alley cat friends, "Dirty Work, Inc." to rid the house of Muscles. But Muscles evicts the alley cats and Tom surrenders to the might of this mouse. After a night out with his friends, Tom is too exhausted to chase Jerry. Jerry takes advantage of this and entices Tom to Mammy's bedroom where Tom takes a nap. Mammy is not pleased and throws Tom out the window where he is picked up by his friends for another night out. Lost at sea on a life raft, Tom washes ashore on a "desserted" island. He meets up with Jerry, posing as a cannibal. 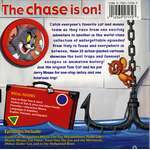 His disguise is discover, Tom chases Jerry then they are discovered by a band of real cannibals and head hunters who in turn chase both cat and mouse. Butch (Spike the bulldog) has just bathed Pup (Tyke) when Tom accidentally get the little dog muddy. Dad is not happy and orders Tom to clean Pup or else. Jerry "helps" with the cleaning and Tom ends up in the washing machine. When Mammy whacks Tom with her broom, he suffers an attack of amnesia and begins acting like a mouse. Much to the dismay of Jerry. Mammy and Jerry both try to knock sense back into Tom. A lazy afternoon, a cool class of lemonade, and Jerry napping in a hammock - until Tom wants it. A battle ensues over the hammock with Spike, a frog, and an army of ants joining in. Jerry and a canary save one another from Tom and take refuge in the Canary's birdhouse. Tom fashoins a piar of wings from a girdle and flies after the Canary and Jerry. Hunting in the woods, Tom wounds a duckling, little Quacker, who is doctored by Jerry. The Hunter becomes the hunted as Jerry and the duck go after Tom. Given the responsibilities, by the tyrannical King, of guarding the grand banquet table, Tom is confronted by the sudden appearance of Jerry and Tuffy (Nibbles), the Mouseketeers. But the mice outwitt the guard, turning the table into a battle field. Another flashback cartoon, this time it's Jerry with the flashbacks. All involving Tom and his women. Mammy babysits three seemingly sweet kittens who turn out to be really nasty! Taking on Tom and Jerry is more than they bargain for and in the end the kittens end up with some well deserved discipline. A baby seal escapes from the circus and is befriended by Jerry. Tom plans to capture the seal for the big reward only to end up in the circus at the end. The mayor issues a leash law and Jerry's proctetor, Spike, is tied to his dog house. Tom takes advantage off this until the law has been revoked and Tom is put on a leash. Mammy gets a mechanical cat that immediately proves its superiority by evicting Jerry. Jerry gets back into the house by releasing an army of mechanical mice. "Mechano" tears up the house chasing them, until he self-desturcts. Mammy is thankful that Tom is still around to take care of Jerry. This is the last screen appearance of Mammy. Tom is a mascot aoard a Honolulu bound ship. He is informed by the captain that if he sees a mouse onboard they will be getting a new mascot. Jerry stowaways and makes life miserbale for Tom. Spike tries to build a dog house of his very own, but the cat and mouse chase always destroy his efforts. The radio reports that a white mouse, having swallowed enough explosives to blow up the city, has escaped from a lab. Jerry takes advantage of Tom's fears and dunks himself with white shoe polish. Then the real white mouse shows up and causes all sorts of trouble. More circus fun when a baby elephant falls from a passing train and rolls into Tom's basket. Tom is able to hold his own when Jerry and the elephant team up, that is, until Mama Elephant shows up. In the house of Johann Strauss is little Johann Mouse, who love to waltz. Every time Strauss played, the mouse would dance. And when the mouse danced, the cat chased. Spike is teaching his son Tyke the facts of life about being a dog. One lesson is chasing cats and Tom happens to be the object lesson of the day. Jerry tries to teach little Quacker how to swim. Scoutmaster Jerry has his hands full with two little orphans from the Bide a Wee Mouse Home. Outfitted in Indian feathers and diapers , the two involve Jerry and the sleeping Spike in a hair-raising battle with Tom. The third flashback toon. This one has Tom reading Jerry's best selling book, "Life with Tom." Jerry resues a sackful of puppies from a storm swollen river and on of the pups follows Jerry home. Tom, being the cat that he is, doesn't want a dog around. The ranch cook tells Tom that he won't be getting any more food unless he gets rid of Jerry. After teaming with Jerry for half the food, they stage a fight that gets rid of Jerry. Tom is fed, but double-crossses Jerry. Tom starts Tyke hic-cupping when he awakens him from his nap. Spike is not to pleased until Tom cures them both of the hic-cups. 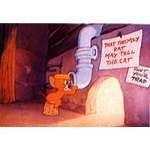 The flip side of Professor Tom, Jerry teaches Tuffy (Nibbles) the art of outwitting a cat. Butch (Meathead) dresses as a baby and leaves himself on Tom's Doorstp as a meand of gaining entry to the refridgerator. Jerry teams up with Tom to foil the sham baby's plot. Jerry and Tuffy (Nibbles) turn the kitchen floor into a ice skating rink. 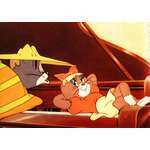 Touring Naples, Italy, Tom and Jerry are befriended by Italian mouse Topo, a champion of justice who helps his new friends fight off some tough Italian dogs. Quacker reads "The Ugly Duckling" and convinced that he's ugly, tries to get Tom to eat him. Jerry tries to convice Quacker that he's not ugly, but it only takes a girl duck to do it. Husband and wife tell Tom and Spike that, due to the high cost of feeding them, one must go, and the one who catches Jerry will stay. Eventually, they both get kicked out. 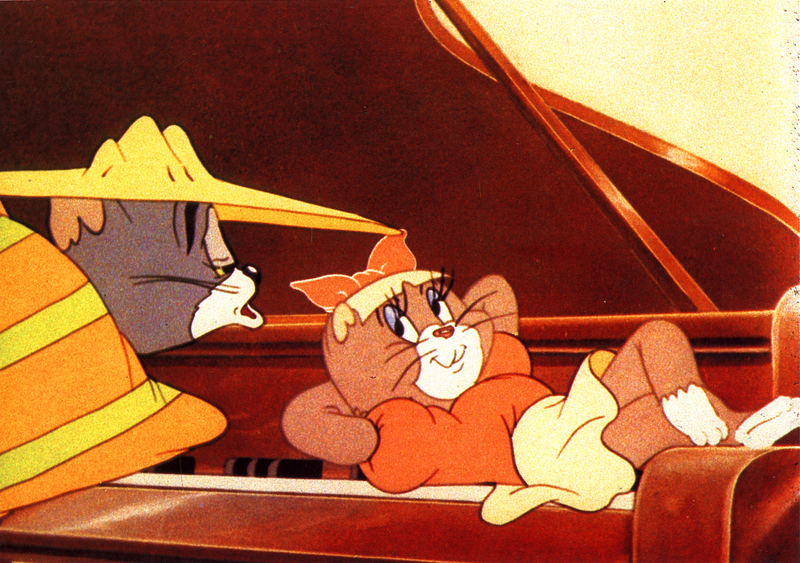 This is the first Tom and Jerry in CinemaScope(ie. Letterbox). Tuffy's father sends him to Jerry for mouseketeer training. He fails miserable and destroys Jerry's place in the process. 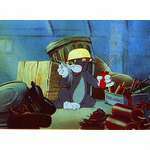 However, he gains the mouseketteer title when he thwarts Tom. Stubborn Quacker, convinced this time that all ducks go south for the winter, refuses to stay home like his domestic buddies even though he can't fly. To complicate things Tom is hunger for a duck meal. Jerry hides in Spike and Tyke's basket to escape from Tom. Food fight fun when Spike, Tom, Jerry, and an army of ants vie for control of the basket. White mice being the new rage, Tom paints Jerry white and sells him. His plan works until the lady of the house buys back Jerry with the money Tom got for the sale. Tom designs the ultimate mousetrap. But the blueprint mouse comes to life to help Jerry out of the trap. The third outing for the mousketeers find Tuffy as errand boy between Jerry and his love. Unfortunately, Tuffy has to deal with Tom during his errands. The last "wrap-around" (flashback) entry. This one finds Tom and his alley cat pals going over home movies. Involving Tom outwitting Spike. Spike discovers the showing (with the help of Jerry) and is not too please with being depicted as a big goof. Jerry's Uncle Pecos spends the evening with his nephew just before a scheduled TV appearance. His guitar string is always snapping and it's always Tom's wiskers that get pulled to replace them. Hatched at Tom's feet, little Quacker thinks that Tom is his "dear sweet Mommy". Tom tries to eat the duck, but his conscience gets the better of him. Tom unsupectingly takes a new job with a witch. He steals her flying broom to return home and scare the wits out of Jerry. A CinemaScope remake of Hatch Up Your Troubles (1949). A prequel to Tot Watchers. This concerns Jeannie, the babysitter whose primary interst is talking on the phone. Tom and Jerry end up caring for the baby only to be blamed for bothering him. Tom and Butch try to impress a girl with their muscle building abilities. A dancing bear, who eascaped from a circus, uses Tom as his reluctant dance partner. When Tom loses his girlfriend to arch rival Butch again, it's too much for him and he ends up on the railroad tracks pondering life. Jerry narrates his downfall. Spike's perfect pool side barbecue with Tyke turns into a disaster when Tom and Jerry crash through. This is a CinemaScope remake of Love That Pup (1949). George, Tom's fraidy cat cousin, comes for a visit. 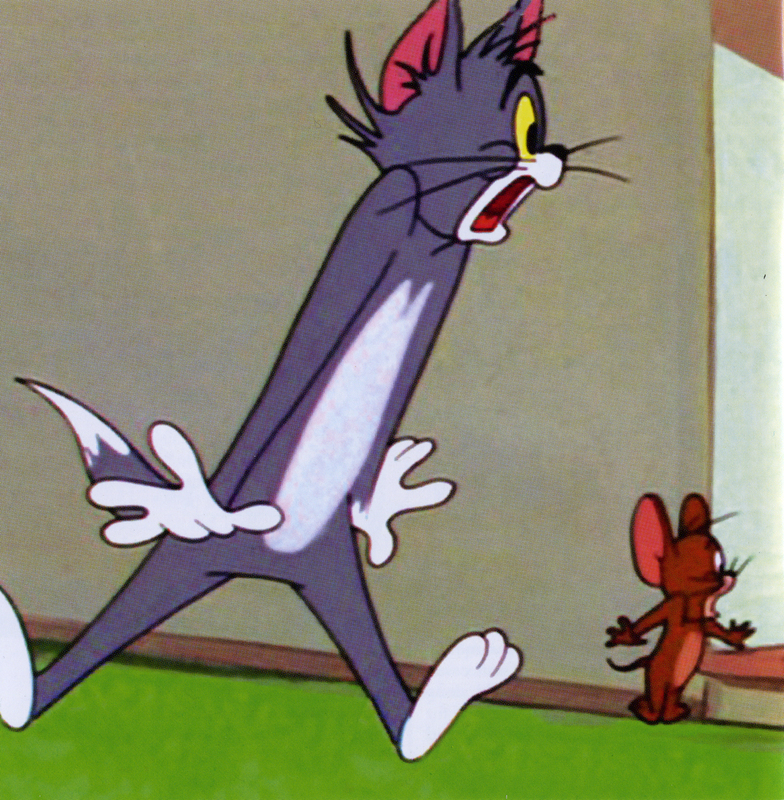 Jerry takes full advantage of George's mouse phobia, until George and Tom team up to scare Jerry. A CinemaScope remake of The Little Orphan(1949). Tom, the "Olympic, U.S. and World Champion Mouse Catcher", heads to Spain to catch "El Magnifico" (Jerry). Tom frames Spike for stealing food from the fridge only to be caught on film by Jerry. Jerry makes several copies of the photo to try to get Tom in trouble. When the Easter Bunny leaves an egg for Tom and Jerry, it hatches into Quacker. The little duck insits on swimming in everything in the house, eventually flooding the place and swiming with a few of his duck friends. The fourth and final entry in the Mouseketeer's series. This time, Tom is gaurding the king while he sleeps. Quacker, in his last Tom and Jerry film, plays a singing duck who becomes Jerry's partner in crime when the tow of them discover the delights of vanishing cream. Daring mice Jerry and Tuffy (Nibbles) try to break Robin Hood out of prison, but they have to get past the guard, Tom. Babysitter Jeannie, still attached to the phone, leaves Tom and Jerry watching the baby. 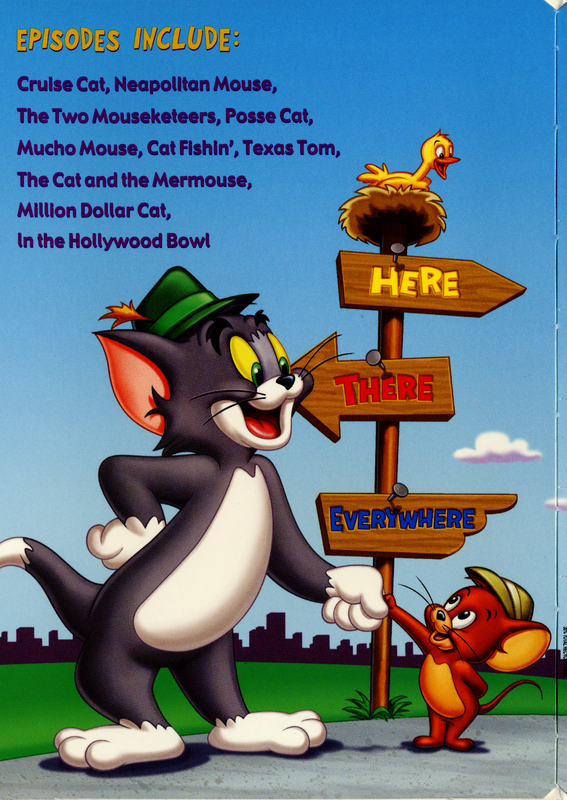 Final Tom and Jerry directed by Hanna and Barbera at MGM studios. Sadly, Tom and Jerry have never reached the quality of these years.